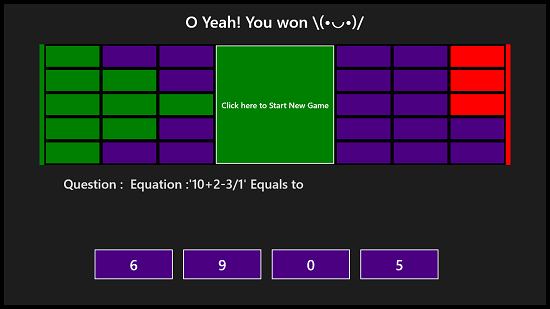 Math Field is a free maths quiz game app for Windows 8 and 8.1 devices. 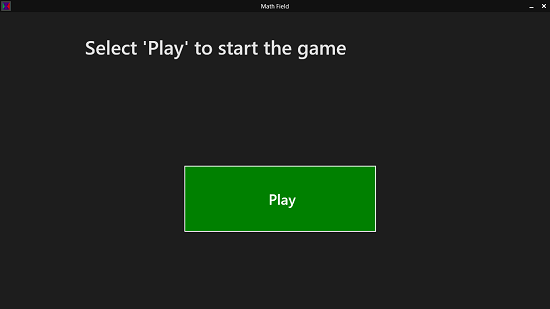 When you launch the game, you will be presented with an interface wherein you will be asked to start the game, which can be done by the simple action of pressing the Play button. When you click on the same, you will be presented with the questions on your screen. In the game, there is a grid at the top, which will help you to keep track of your answers as and when you answer them. The gird at the left corresponds to the correctly answered questions, whereas the grid on the right corresponds to incorrectly answered questions. The game has a lot of questions to keep your maths genius busy, and with each question, the game progresses in difficulty. Math Field can be downloaded for free from the App Store. You will be presented with the below interface when you launch the Math Field app on your device. To start the quiz, all you have to do is to simply click on the Play button at the center of the screen. It’s hard to miss it, as it’s the only thing which is present on the main screen! 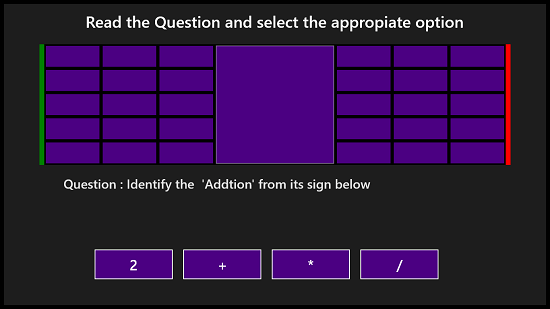 Once you have pressed the same, you will be taken to the quiz interface wherein you will be shown the various questions one by one on your screen. The quiz interface looks somewhat like the below screenshot. To answer a question, you have to click on the option which you feel best suits the answer to the question. Once correctly answered, the green boxes at the top will be shaded. Incorrectly answering a question will make you lose points and the red boxes at the top right will be shaded out. There are a set number of questions in the game, so when you correctly or incorrectly answer them all, it’s game over, and you can assess your performance by having a look at the grid on the top of the screen. A new game can also be easily started by clicking on the Click here to Start New Game button at the top center of the screen. This winds up the main features of the Math Field quiz game app. 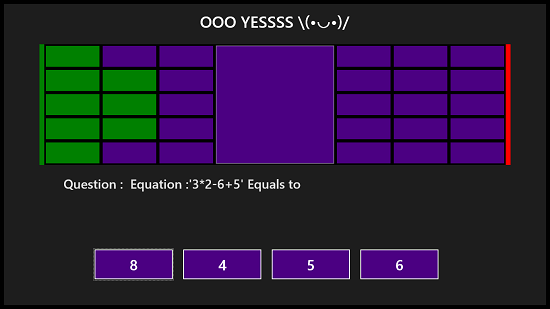 Math Field is a very well designed math quiz game app for Windows 8 and 8.1 which allows you to sharpen your math and mental math skills by playing a quiz constantly increasing in difficulty level with each question. Each time it presents you with different questions, and this is what makes it even more challenging!